Bol. Soc. Bot. Mexico 24: 37. 1959. TYPE: Mexico. Oaxaca: road between Cerro Pelon and Yetia, 2,600 m, MacDougall 405 (MEXU). Epiphyte or on rocks; to ca. 1 m tall; stems 4-8 cm diam. ; leaf scars 4-6 cm wide; roots thick, tan, descending; cataphylls coriaceous 9-13 cm long, acuminate at apex, subapical apiculum 1 cm long, drying dark brown, persisting intact at apex, splitting at base into coarse fibers. LEAVES erect to spreading; petioles 27-78 cm long. 5-17 mm diam., subterete, weakly sulcate; geniculum 2-3 cm long; blades subcoriaceous, ovate, acute at apex (the acumen minutely apiculate), deeply lobed at base, 30-65 cm long, 20-50 cm wide, broadest near point of petiole attachment, the margins somewhat irregular and undulate: anterior lobe 23-50 cm long, the margins convex; posterior lobes 7-20 cm long directed upward or flat; the sinus spathulate, acute at apex; both surfaces matte to semiglossy; midrib convexly raised above and below, diminishing and sunken at apex above; basal veins 8 pairs, the first and second (sometimes third) free, up to 5 coalesced 1-2 cm, raised above and below; posterior ribs not marginal; leaf tissue turned up at margins; primary lateral veins 5-7 per side, departing midrib at 35° angle, sunken above, raised below, arcuate-ascending, loop-connected near the apex; lesser veins conspicuous and flat on upper surface, prominulous on lower surface; collective vein arising from first basal vein or one of the uppermost primary lateral veins, 10-18 mm from margin, sunken above, raised below. 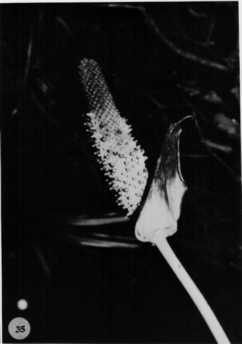 INFLORESCENCE spreading, shorter than leaves; peduncle 22-45 cm long, 8 mm diam., terete, as long as petioles; spathe subcoriaceous, medium green (B & K Yellow-green 6/7.5), tinged at margins with purple or very heavily tinged with purple inside, narrowly ovate, 9.5 cm long, 2.3-4 cm wide, broadest near base, caudate-acuminate at apex (the acumen ca. 1 cm long), obtuse to rounded at base and clasping, inserted at 30° angle on peduncle; spadix violet-purple, sometimes green turning violet-purple (B & K Red-purple 2/5), 5-11 cm long, 0.8-1.5 cm diam. at base, 5-7 mm diam. At apex; flowers square, 2.7-3 mm in both directions, the sides weakly sigmoid; 10-14 flowers visible in the principal spiral, 8-12 flowers visible in the alternate spiral; tepals matte, with dense, pale punctuation's, minutely papillate; lateral tepals 1.8-2.2 mm wide, the inner margin convex; pistil not visible before anthesis; stamens developing from the base in a complete sequence, the leading lateral stamens 1-2 spirals ahead of the fourth stamen; anthers ca. 1.2 mm long, 0.5 mm wide; thecae ovate-oblong, scarcely divaricate. 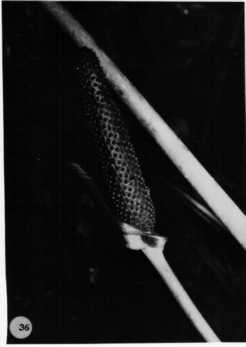 INFRUCTESCENCE pendent; spadix to 15 cm long, 4 cm diam. ; berries obovoid, mammilliform at apex, orange (? ), 9-10 mm long, 7-9 mm diam. ; mesocarp fleshy, thick; seeds usually 2, 7 mm long, 4.5-5.5 mm wide. Figs. 35, 36, and 37. Anthurium cerropelonense is endemic to the Sierra de Juarez in the Sierra Madre Oriental in Oaxaca at 2,400 to 2,800 m in cloud forests near the summit of the Atlantic slope. The forest type is "selva alta perennifolia." All collections have been made along Highway 175. 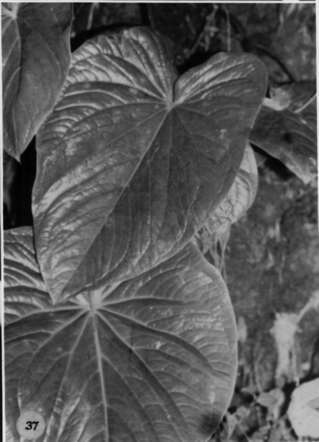 The species is characterized by its large, thick, ovate-cordate blades, narrow or closed sinus, posterior rib rather distant from the leaf margin, and by conspicuous tertiary veins, and also by its thick, dark violet-purple spadix. Unlike most Mexican species, which appear to be related to several other species, A. cerropelonense seems to be unrelated to or confused with any other species. It is tentatively placed in section Belolonchium. Mexico Oaxaca:, , MacDougall 405 (MEXU). Mexico Oaxaca:, , Almeda & Luteyn 1666 (DUKE). Mexico Oaxaca:, , Graham & Frohlich 1105 (MICH). Mexico Oaxaca:, , Thomas B. Croat 48180 (MO). Mexico Tamaulipas: 80 m, 22.34N 99.02W, 12 Jan. 1987, Thomas B. Croat and Dylan P. Hannon 65645 (MO).